Several weeks ago I blogged about how I store dahlias. Did you keep some of yours too? If you haven’t already done so, now’s the time to check on them to see how they’re doing. Serious dahlia growers begin planting their tubers in mid-March, in pots and in a greenhouse of course. I opened mine up right after the polar vortex blew through a couple of weeks ago. They were in a spot that normally stays cool but never freezes. However, this fall I rearranged boxes and stuff in the garage. Without realizing it, doing that must have changed the airflow pattern and allowed cold air to settle in the spot where I stored my dahlia tubers. I didn’t have a thermometer in that area but I knew it got cold because the storage bags were partly frozen. That’s not a good sign. They didn’t look too bad when I opened them up to take a peek, but some looked to be partly frozen. The outside layer of damp sawdust was lightly froze. Instead of warming the tubers up to thaw, I moved them to another more temperate part of the garage to slowly warm up. Today I finally brought them out to see how they were doing. It’s very easy to tell the damaged tubers from the undamaged. The one on the left was frozen. As suspected, most of them were damaged beyond salvaging, I’m looking at about an eighty percent loss. The ones that survived look healthy though. I’ll re-pack the good ones in fresh sawdust and compost the rest. I also had some elephant ears tubers in storage, those I kept in the pots that they grew in last summer. They look pretty good. I gave them a small amount of water whenever the soil looked really dry — maybe once every other week or so. In the spring I’ll knock them out of the pot, divide them and replant. You can’t see much in this photo but the elephant ear roots are looking good. 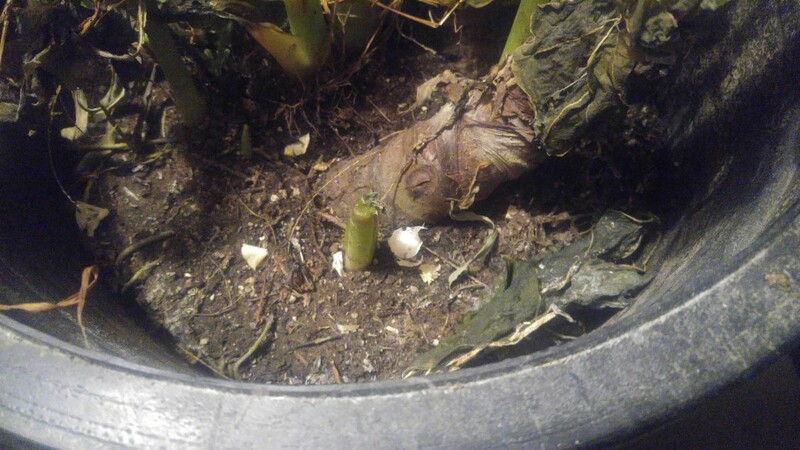 Other large pots have cannas that I stored the same way as the elephant ears, right in the pots they grew. They got some water through the winter too but not as much as the elephant ears. I wanted to keep them a little on the dry side so they wouldn’t get water logged and rot. Remember, they are dormant and not growing so they don’t really need much water. On the other hand you don’t want them to dry out and shrivel up. It’s something you have to learn trough experience. I usually ere on the side of less water. 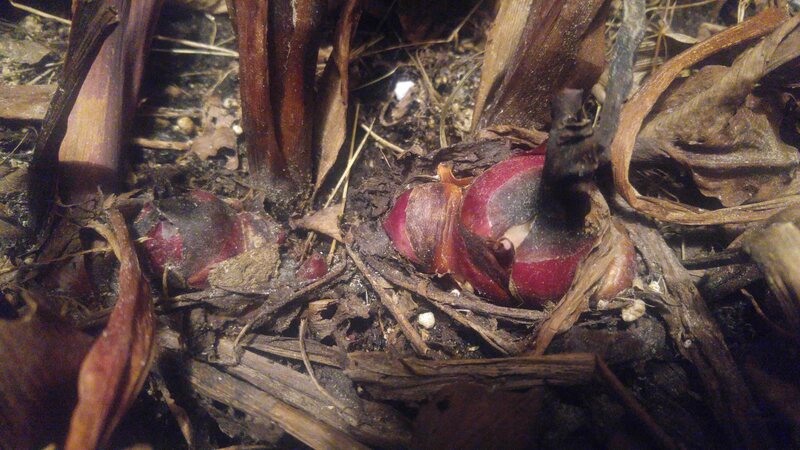 The canna bulbs are in fine shape at this point in time. Unfortunately, we lost a large geranium to the cold. It was one that we’ve been saving and taking cutting from for years and years. During the most recent warm-up, we set the potted plant out on the front porch and — you guessed it — forgot it was there and it froze overnight. There may be some dormant buds that survived, I’ll let you know how that turns out. This is another episode in the grape vine cutting story that began last spring. At that time I took some pieces of grapevine that I cut off the vines during pruning and used them to start new grapevines. You can browse through my older blog posts to find out about those grapes. I stuck the cuttings into a soil mix and grew them through the summer. Nearly all of the cuttings developed a good set of roots and had nice tops. Then last fall I buried them in a trench in the garden to help protect them from any potential harsh winter weather. As it turned out, this winter was so mild they probably would have done just fine in their pots with some mulch banked up against them. The best cuttings had strong leaf buds and plenty of roots. Earlier this spring I dug them out of their trench, set them in a shady spot and made sure they were watered well. I ended up with 15 good plants which was about half of the cuttings I started with. Last week I planted them into their permanent spots near the edge of the garden. They’re off to a good start in their new location. Retail prices for grape plants like these can run nine or ten bucks each — before shipping. Taking grape cuttings can save you lots of money if you’re interested in starting a vineyard. The biggest drawback is that you have to wait a year for the cuttings to turn into plants. Come to think of it, this grapevine story started way before last year. Those vines I pruned and took the cuttings from last spring were themselves started from cuttings 15 years ago. It’s that time of year again. The new seedling growing season is just about here. After a few years of gardening under their belt, many gardeners get the urge to start their own plants indoors, especially after paying retail prices for started plants. To be fair to retailers out there, when you consider all of the labor, materials, heating costs, insurance, taxes, transportation, greenhouse construction costs and overhead, most of the time those prices from garden centers are quite reasonable. Before the first seed is sown, I make sure I have all of my materials and supplies ready to go. Gathering up containers such as pots and seedling trays are the first thing that needs to happen. I haven’t had to buy any pots or seedling trays for many years. I always recycle and reuse plastic planting containers. Many of them I’ve salvaged or were given to me by others. Modern plastics are very durable and last a long time. Some of my pots have seen more than ten years of use. The problem with reusing plant starting containers is that they can easily become a source of disease that can decimate your seedlings. This is especially true if some one gives you their used containers, even if they assure you that the pots are perfectly clean. Of course if you purchase new pots and trays, there is no need to worry about disease — the manufacturing process destroys any microorganisms. It’s relatively easy to get those used planting containers in shape using simple washing techniques, just as long as you do it in the right order. First, rinse off all large clumps of old soil still stuck on the pots. This is best done outside to avoid getting dirt in the sewer system. Next, wash the containers with dish-washing detergent, I keep a bottle of cheap detergent from year to year for garden use. This is the a critical step because disinfecting agents won’t work if dirt is present. Rinse off the detergent, then dip everything in a bleach solution. One part bleach to nine parts water works well. Rinse again and the containers are ready for potting soil. This procedure almost sounds like the steps a Mom would take to clean bottles for her young baby: rinse, wash, sterilize. When you think about it, we are preparing containers for babies — baby plants. Also, always start with new sterilized potting mix. Now, I know that some master composters — yes there is such a thing as a master composter –have had success using compost as a starting medium. They use material from a hot compost that heated up enough to kill plant pathogens. Most of us however, shouldn’t take the risk of using our everyday compost that we have in the back corner of the garden. Like most things in life, an once of prevention is worth a pound of cure. I’ve started growing some sweet potato vines that I will use to take cuttings for planting sweet potatoes. These cuttings are more commonly known as slips. It’s not always easy to find sweet potato slips to plant when you need them. In years past I’ve had to visit a few garden centers before finally tracking them down. Calling ahead doesn’t always seem to help either. I’ve seen all kinds of contraptions that people have come up with to grow sweet potato slips, most of them involve suspending a sweet potato root over water. 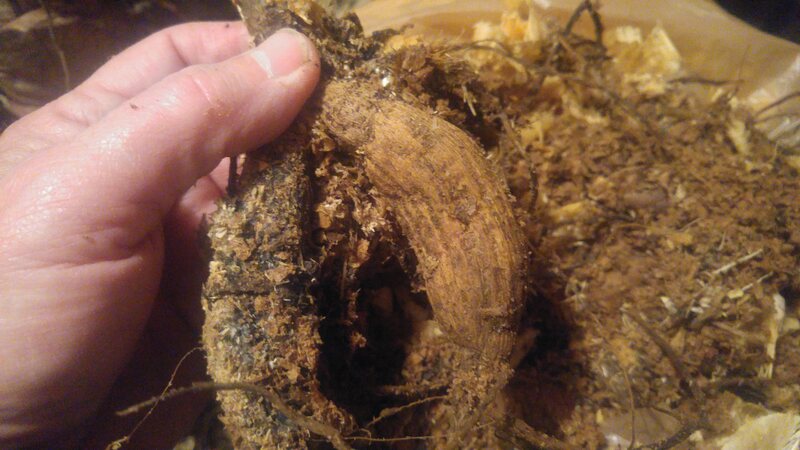 All you really need to do is to place a sweet potato root into a container of damp potting mix about two inches deep. Keep the container in a warm spot — 75 degrees F and be sure it stays moist. An electric heat mat will help if you don’t have a warm spot. This sweet potato is making good growth. I’ll cover the root with soil entirely at this point.